WHAT MAKES A LEADER? CAN YOU REALLY LEARN TO LEAD? You might believe that leaders are born, not made. Perhaps you think that you need to hold an important job to be a leader-that you need permission to lead. Leadership is one of the most important aspects of our society. Yet there is enormous disagreement and confusion about what leadership means and whether it can really be learned. 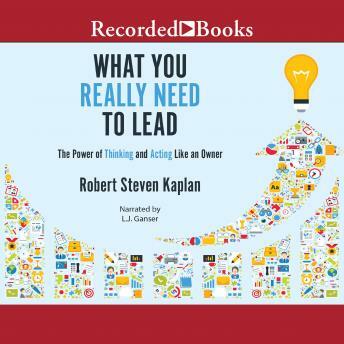 As Harvard Business School professor Robert Steven Kaplan explains in this powerful new book, leadership qualities are not something you either have or you don't. Leadership is not a destination or a state of being. Leadership is about what you do, rather than who you are, and it starts with an ownership mind-set. For Kaplan, learning to lead involves three key elements: - Thinking like an owner - A willingness to act on your beliefs - A relentless focus on adding value to others Kaplan compellingly argues that great organizations are built around a nucleus of people who think and act with an ownership mind-set. He believes that leadership is not a role reserved only for those blessed with the right attributes or situated in the right positions of power. Leadership is accessible to each of us-today. It requires a process of hard work, willingness to ask questions, and openness to learning. This book aims to demystify leadership and outlines a specific regimen that will empower you to build your leadership skills. Kaplan tells real-life stories from his own experience of working with various types of leaders seeking to improve their effectiveness and make their organizations more successful. He asks probing questions, provides exercises, and suggests concrete follow-up steps that will help you develop your skills, create new habits, and move you toward reaching your unique leadership potential. What You Really Need to Lead will help you develop your capacity to lead by unlocking your power to think and act like an owner.